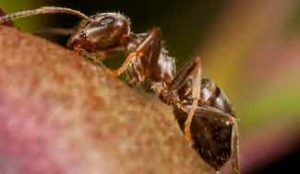 Our Ants Exterminator will identify the source of the Carpenter Ants infestation and create a customized Ant Pest Control Plan to eliminate the Ants. Let us be your Ant Killer Company, give us a call today 1-844-305-8999. We Have The Know How To Get Rid Of Ants. Ant infestation is the most commonly reported pest problem. These tiny scavengers will enter your home or business looking for moisture and an accessible food source. Rotting or damp wood that is moldy can attract ants and become ant infested. Ants also feed on sugar, cheese, meats, vegetables, grease, peanut butter, and dead insects. Ants often enter a home through cracks around windows or doors, but they can find numerous entrances to your home or building. Once inside, the growing ant colony can become a problem quickly, as ants mature from juveniles to adults within a matter of days. For Superior Ant Extermination our Ant Exterminator will utilize a combination of ant killer baits to eradicate ants from your property. 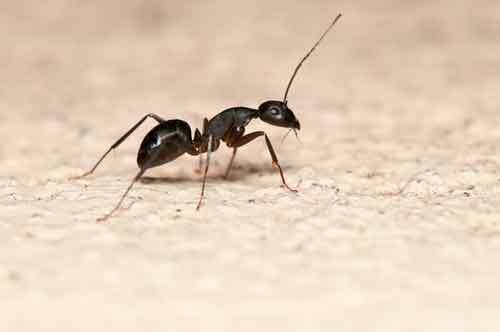 It is necessary to properly identify the ant species that you have in order to effectively eradicate them, our trained Ant Exterminator will identify your ant infestation and provide an ant pest control solution. Of the thousands of species of ants, the four listed below are the most commonly found in the United States. Carpenter Ants: are about five eighths inches long. They tend to burrow in damp wood but have also been known to damage solid wood. They do not eat the wood, but simply remove it to build a nest. Carpenter ants attack Wood wherever excessive moisture accumulates in parts of dwellings, other buildings, power poles, and fence posts. Especially vulnerable are porches, roofing and areas near kitchens and bathrooms where water from poles and building foundation timbers come in contact with the ground absorb large amounts of moisture from the soil and are thus susceptible to ant colonization. Red Imported Fire Ants: vary in size from one-eighth to three-eighths inches. They construct large mounds for nests and administer painful stings. It is important not to disturb a Fire And Colony, When a mound is disturbed, ants emerge aggressively to bite and sting the intruder. A white pustule usually appears the next day at the site of the sting. 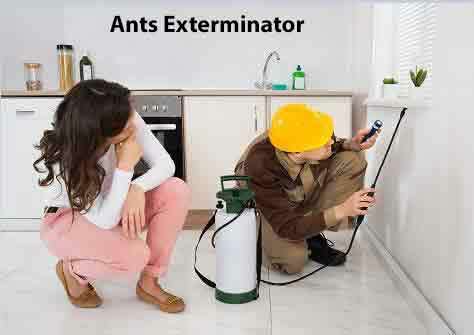 At Dependable Exterminating we specialize in exterminating all Ant Species. 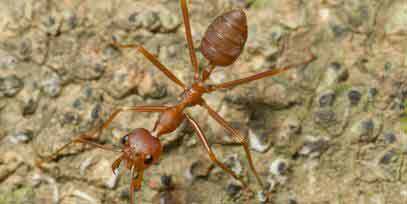 Pharoah Ants: are about one-sixteenth inch long. These ants are commonly found in hospitals and nursing homes, where they are capable of transmitting Staphylecoccus and Psuedomonas infections. Pharaoh Ants also invade restaurants, apartment buildings and similar dwellings. Pharoah Ants have three body regions (head, trunk, and gaster) distinctly defined by narrow constrictions. They have elbowed antennae, and the gaster is attached to the thorax by a waist that consists of one or two small separated segments. There are three distinct castes of ants: queen, male, and worker. Pharaoh ant workers have a non-functional stinger used to generate pheromones. There may also be different forms of each caste. Ants always live in societies known as colonies. Workers are wingless, but at mating time swarms of males and females are produced, usually winged. Pavement Ants: are about one-eighth inch long. They generally make their nests in pavement cracks and are also capable of infesting a building or home. Pavement Ants tend to live near homes and businesses, these ants often make their way inside looking for food sources such as sweets, and dead insects. They are also looking for a warm place to overwinter. Keeping Pavement Ants out of homes and buildings is an ongoing process, not a one-time treatment. At Dependable Exterminating we offer yearly Ant Control Programs.